For some stupid reason, every time I try and say Gletscher, it's always done in an awful Schwarzenegger accent. How does that even make sense? Roberto Galati, the man behind this double-LP, is Italian, as unique a language as any European dialect. What does 'gletscher' even mean? *does the Googoling* Oh, it's the German word for 'glacier', commonly referring to ice flows near the Tyrol region of The Alps, where northern Italy and western Austrian meet. And Ah'nold is Austrian. So, despite Gletscher being produced by an Italian, saying this album's title in an awful Schwarzenegger accent does make sense after all. Well, no, it doesn't, but that's my English for you, always mocking other languages with our too-many wordses. So Mr. Galati is something of a post-rock ambient guy. This means plenty of droning guitar tones and distortion with his layered synths. He also has quite the fascination with frozen landscapes, previous albums Floe Edge and Godhavn inspired by treks across Greenland wastes and the like. Even his last CD with Psychonavigation Records, Mother, has a cover collage of various frozen features (alpine peaks, tarn, ice-covered cave entrances... maybe). I guess naming this LP straight-up ‘glacier’ would have been too obvious then, but at least I’m getting some serious Geir Jenssen vibes from all this background research. 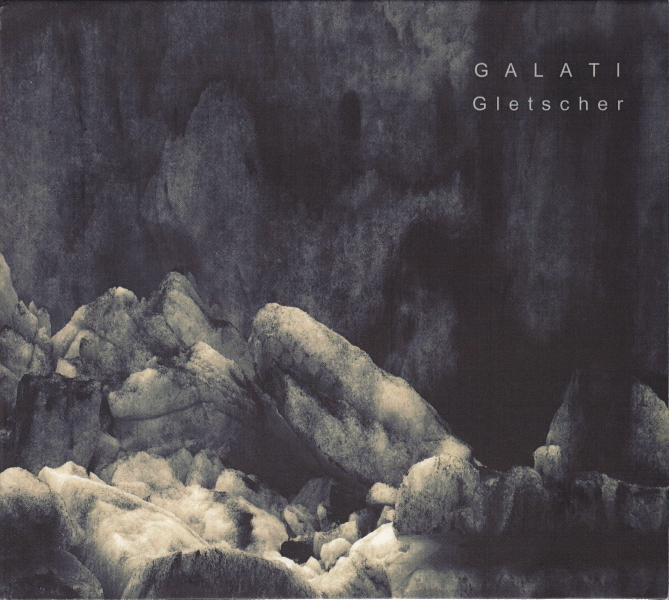 Gletscher is also one of those drone albums that’s almost impossible to detail. Galati goes for the wall-of-sound approach to the craft, stacking harmonic layers to such a degree they’re almost crushing your senses. Everything moves ve-e-r-ry slow too, though at least we have a sense of progression through these tracks, that we’re taking in a vista rather than sitting static for a length of time. I’m tempted to call this ‘epic drone’, because it sure feels like my very being is being confronted, forcing me into humbling reverence to the soundscapes Galati’s challenging me with. It’s at once exhilarating and exhausting, and definitely not the sort of ambient music suited for naps or a session at the massage parlour. Aside from the two bookend pieces on both CDs, these tracks are surprisingly short for drone, none breaking the nine-minute mark. It makes the need for two discs seem a bit suspect since most of them probably could have fit on just one, but then I guess you’d have to jettison the nineteen-minute closer Shelkar Chorten. On the other hand, these relatively shorter pieces helps keep Gletscher engaging as it plays through, each track shifting in tone just enough so we’re not stuck in one mood for long. Hopar has a calming through-line, then Gharesa goes discordant. Something resembling a wide-screen melody pierces the drone in Siachen 1, while Kiattuut comes off more atonal. Hispar (everlasting night) is rather quiet and subdued, and Godwin-Austen features chattering harmonic strings with a lovely bit of sombre melody. Gletscher isn’t an easy album to get into – really, only fans of drone should apply. Boy, did it ever make for some intense bus commutes though. This isn’t the sort of album where individualism reigns.